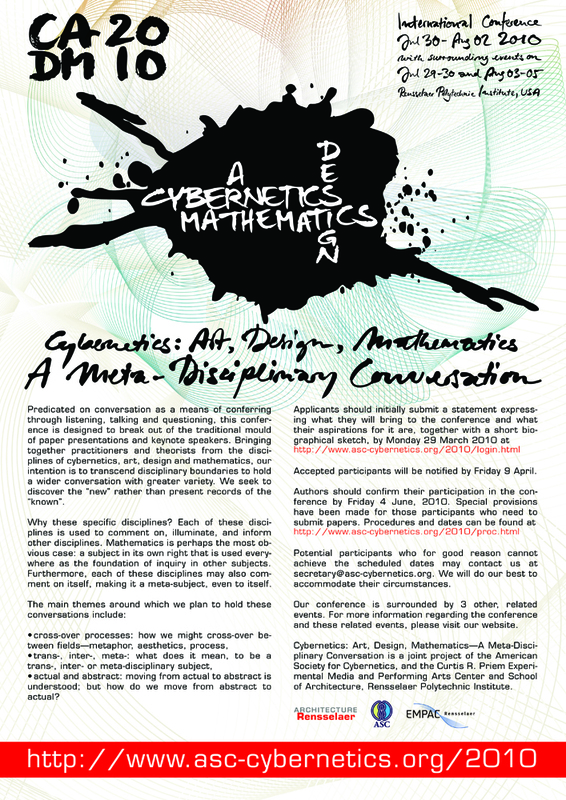 The Conference Cybernetics: Art, Design, Mathematics—A Meta-Disciplinary Conversation is expected to generate two separate proceedings. Papers accepted for the conference will be published, after due refereeing and rewriting processes, in the journal Kybernetes. Layout and referencing conventions should be those used in that journal. The outcome of the Workshop will be published as part of the series “Complexity | Design | Society” by edition echoraum, in Vienna. This book will be closer in concept to Mary Catherine Bateson’s “Our Own Metaphor,” than a normal proceedings but with the added possibility to use links to richer media, on DVD or on the web. In addition, there will be an Exhibition (at the conference) of the standards that participants produce, a conference booklet and a web site with draft papers.